The relative affordability of garden buildings as a way of adding to accommodation is just one of the factors that helped grow the market by around 3.5% last year. In its latest report on domestic garden buildings and structures, AMA Research says demand grew across the board, from lower value sheds and greenhouses, through to high value garden rooms and tree houses. The health of the sector is influenced by a range of factors. For example, at the top end the trend towards homeworking has continued, and there is also a growing need to provide accommodation for parents and children unable to enter the housing market, which has driven demand for garden rooms. Also benefiting the market are the increasing use of garden buildings for leisure activities, while at the lower end there has been an increase in outdoor storage solutions other than the traditional shed. 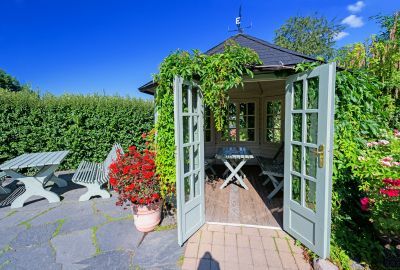 The weather can also have a significant impact, the report points out; for example, summerhouse sales are very seasonal and so can be badly hit by poor weather. On the other hand, damaging stormy weather can stimulate demand for replacements. Sheds and storage represents the largest product sector, with a 35% share, followed by garden buildings for all year use, and log cabins and summerhouses, each accounting for over 20% of the market. The sheds and storage sector is mature and has been affected negatively by the trend towards buying cheaper sheds, but has seen steady growth in recent years, while the log cabin and summerhouse sectors were more markedly affected by the economic downturn. AMA says DIY multiples are the leading distribution channel, estimated to hold 40-45% of the market. Online, mail order and catalogue companies, garden centres and direct supply, grocery multiples and high street retailers all also have a share. "The shed and greenhouse sectors are mature and more dependent on replacement purchases," commented AMA Research director Andrew Hartley. "Consequently growth rates are forecast to be more modest in the medium and long term, with annual growth rates of 2-4% to 2020. "In contrast, garden rooms and other buildings used for working, accommodation and leisure represent less mature sectors with high potential for growth."